We continued to see incredible growth this November. More groups used our tools than ever before, and small-dollar donors raised 2.7 times more money than in November 2015. Some of this growth even outpaced historical patterns: Supporters raised more money in November than they did in October for the first time since 2011. Folks had many reasons to be motivated, from the major Democratic gains in state and local elections on November 7 to the special Senate election in Alabama this week. The month also ended with one of the biggest fundraising days of the year: Giving Tuesday, the charitable response to Black Friday. A record-breaking 4,771 campaigns and organizations raised money on our platform last month. A lot of this growth came from the unprecedented number of people choosing to run for office. Additionally, small-dollar donors made nearly 100,000 more contributions in November than they did in October 2017, even though October benefitted from final Election Day pushes. On Giving Tuesday, we saw clear spikes in contributions at certain hours. The chart below shows the number of new contributions to both 501(c)3s and 501(c)4s on the big day by hour (Eastern Standard Time). Donations started off early at 7 a.m. and spiked at 3 p.m., but the busiest hours by far were after the end of the traditional working day. There was a massive bump at 7 p.m. and another at 11 p.m. as supporters tried to get their donations in before the deadline. Our automatically mobile-optimized contribution forms help empower grassroots donors during big moments. When a candidate or organization launches a rapid response campaign, mobile-optimized forms allow donors to give quickly, no matter what device they’re using. With 40.7% of all contributions made via mobile last month, groups that aren’t thinking with a mobile-first mindset will miss out on a huge number of contributions, especially during breaking news. This November, 21.4% of all contributions were recurring. As we’re not even a full year into Trump’s presidency, recurring donations are more important than ever so that the groups opposing his policies have the funds they need to stay in the fight. Our Customer Service team received over 22,000 emails in November — that’s more emails than there are people in Concord, Massachusetts, where the Revolutionary War started! December is already proving to be busy, with important fights over government spending, DACA recipients, and children’s health care. And nonprofits are in the thick of their busiest season of the year. We expect to be busy right through New Year’s Eve. If you want help perfecting your end-of-year fundraising strategy or planning for next year, or if you have questions about this post, get in touch with us at info@actblue.com. Small-dollar donors worked tirelessly on a wide swath of issues this October. Folks prepared for the 2018 midterms, quickly rallied for victims of the devastating wildfires in Napa Valley, and made a hugely successful pre-Election Day push. By the time October ended, candidates, organizations, and nonprofits using our tools had raised $47,600,346 from more than 1.2 million contributions. Additionally, an impressive 4,736 unique groups used our tools, including more local and state candidates than usual. The hard work that state and local campaigns put in paid off. Democrats won races for governor in Virginia and New Jersey, made huge gains in the House of Delegates in Virginia, and helped elect groundbreaking candidates like the first woman mayor of New Hampshire’s biggest city and the first transgender woman in Virginia’s state house. There were many more victories around the country that would not have been possible without widespread grassroots energy. Last month small-dollar donors made nearly one million more contributions than in October 2013 and more than doubled the total dollar amount raised via our platform compared to October 2015. It’s a real sign of strength to see so much money go to Democratic candidates and progressive organizations in a non-presidential election cycle. People all over the country are also facing the GOP head-on by choosing to run for office, and small-dollar donors are stepping up to support them. The number of candidates for local, state, and federal offices using our platform all more than doubled from October 2015 to this year. 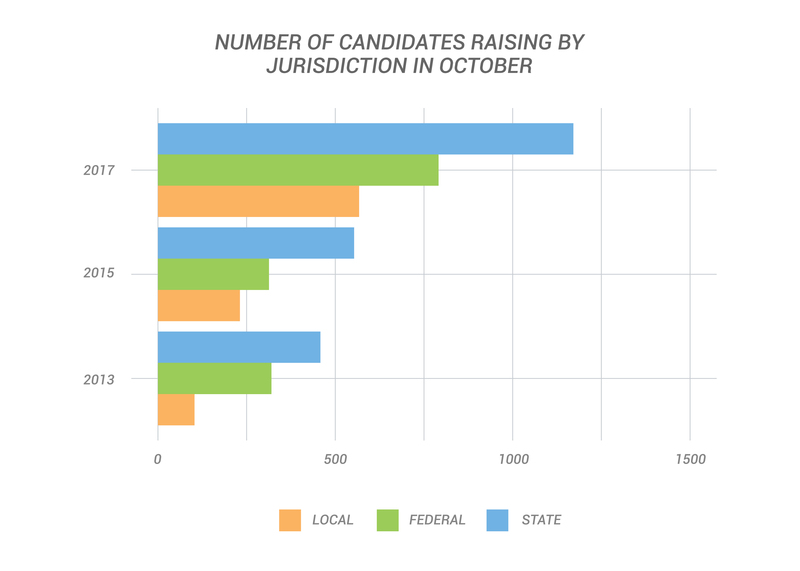 There were 567 candidates for local office; 1,171 state candidates; and 791 federal candidates raising money via our platform this October. Donors really see their contributions as an act of resistance. When Ted Cruz compared ActBlue’s platform to the Koch brothers in a televised debate with Bernie Sanders in October, our supporters were quick to correct him on Twitter. They made it clear that they use our tools to stand up to the GOP’s mega-donors by giving to grassroots campaigns. This event was a great reminder that there’s no limit to the number of ways we can elevate the voices of small-dollar donors. 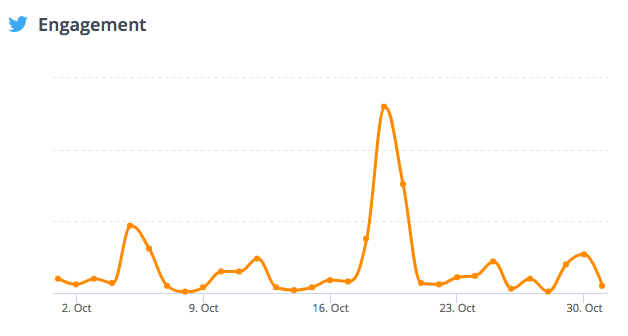 In the chart below, you can see the jump in organic online engagement on Twitter the day of the debate. We even featured some of our favorite tweets from our community in a blog post. If you want to keep up with future breaking news events, you can follow us on Twitter @actblue! With 40.7% of all contributions and 41.2% of ActBlue Express contributions coming from mobile, October showed us the continued importance of mobile optimization. That’s why ActBlue’s contribution forms are automatically mobile-optimized. It’s vital that donors are able to easily give on whatever device they prefer to use. 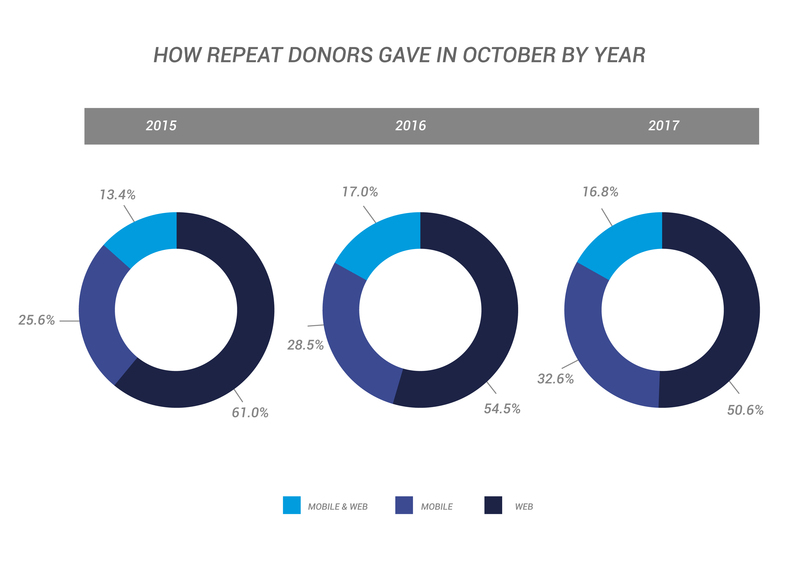 Over the past three Octobers, we’ve seen that many donors will only give via mobile. If campaigns and organizations don’t have mobile-first mindsets, they won’t be able to reach all of those supporters. And we only expect the percentage of donors giving via mobile to increase over time. Recurring donations were worth almost $10 million in October and accounted for more than 20% of our total volume. These monthly and weekly contributions give campaigns and organizations a sense of stability by enabling them to plan ahead. 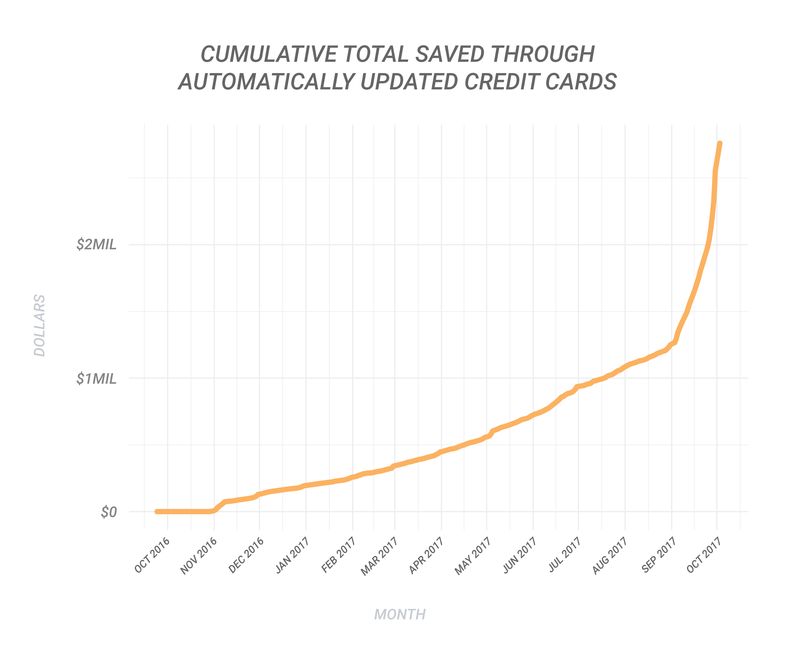 That’s why we built an integration with Account Updater that automatically updates expired or replaced credit cards used for recurring contributions, ensuring donations are not interrupted and make it to the campaigns and causes small-dollar donors support. This feature has proven to be increasingly important as hacks of credit card companies and similar organizations become more frequent. 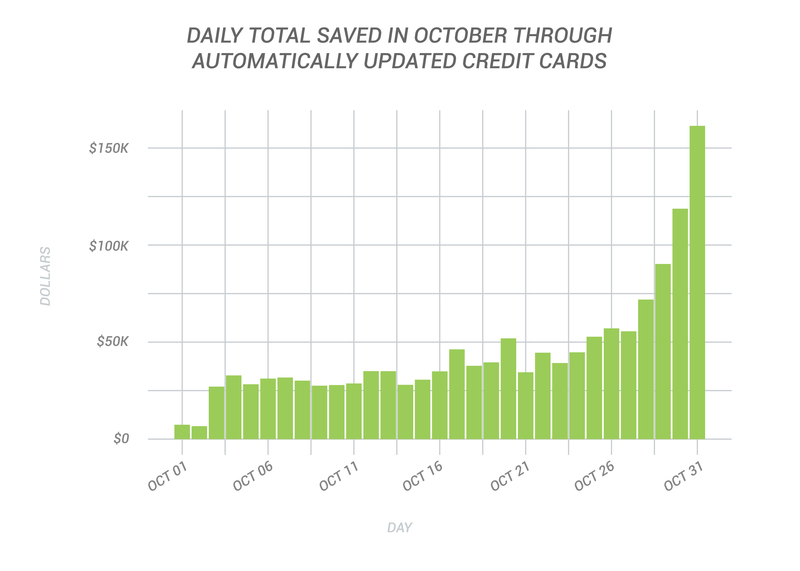 This October, Account Updater saved a significant number of recurring contributions. On average, 13.3% of recurring contributions were updated each day. On the last day of the month, when a large volume of recurring contributions were processed, we peaked at 21.8% updated. These numbers are huge — we typically only update 1% of recurring contributions per month. Overall, 14.1% of all recurring contributions were updated in October, benefiting 2,740 groups. That means Account Updater saved donations for 57.8% of all unique campaigns and organizations on our platform! With such a strong October to kick off Q4, Democratic candidates and progressive organizations are heading into 2018 on a high note. We expect even more small-dollar donor power to be on display on Giving Tuesday as nonprofits head into their busiest giving season of the year. If you’d like help planning your end-of-year giving as an individual donor or as an organization, or if you have any questions about this post, get in touch with us at info@actblue.com! Small-dollar donors didn’t take a summer vacation from the resistance. Instead, they doubled down on grassroots fundraising for timely causes and future elections — literally. 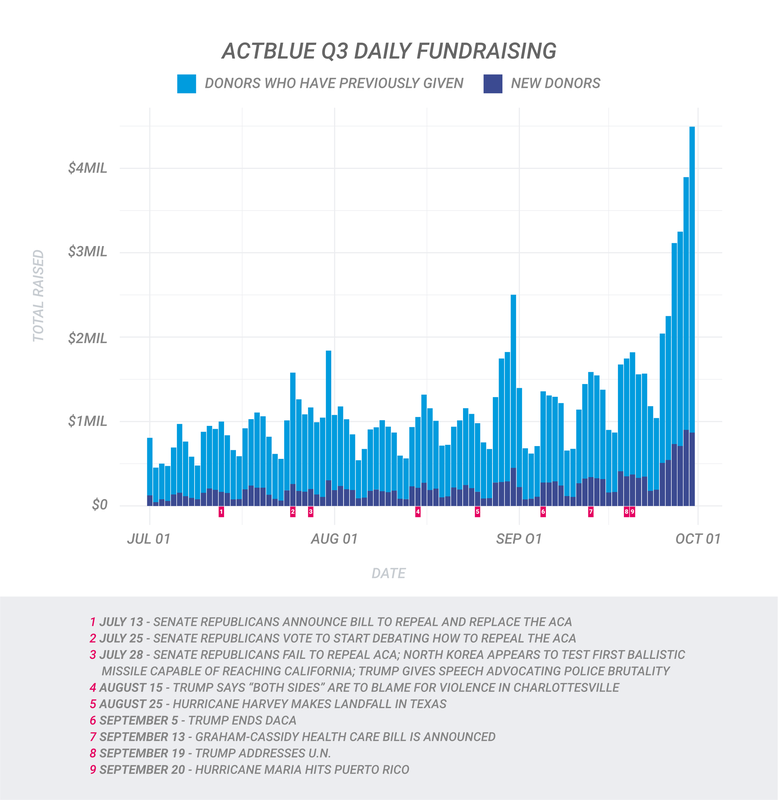 The total money donors gave using ActBlue’s tools in August 2017 was more than double the total we handled in August of the last election cycle. Even more exciting, more campaigns, committees, and organizations used our tools last month than in any other month in our history, with over 4,000 groups raising money in August. To top it all off, as of August 28th we’ve already helped candidates and organizations raise over $300 million for this election cycle. This is the first time that’s ever happened in an off-year! It took 663 days to pass $300 million in the 2014 cycle; 426 days in the 2016 cycle; and only 240 days this cycle! Candidates and organizations raised over $32 million in August from over one million contributions. 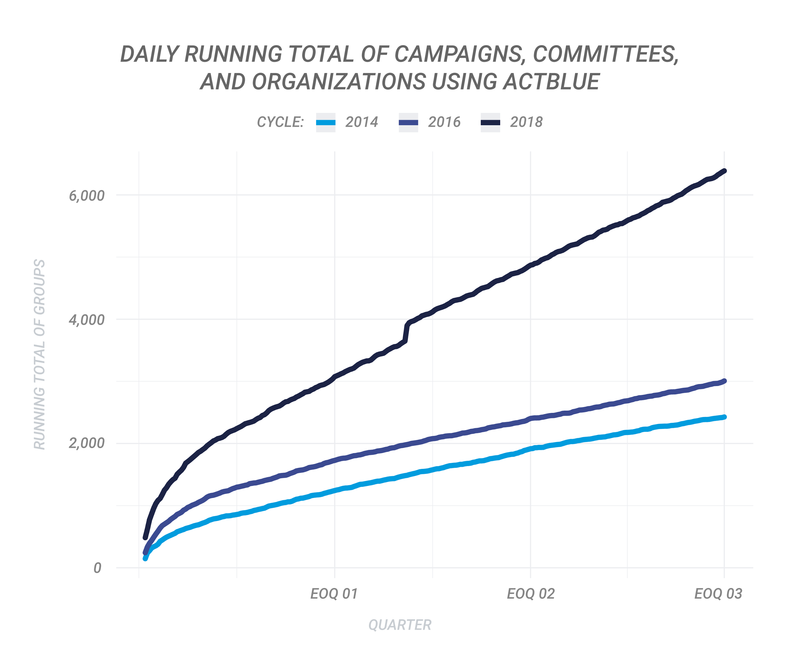 The number of contributions nearly doubled from August 2015 to this year, but the metric we’re most inspired by is the breadth of candidates and organizations using ActBlue’s tools compared to past years. Now more than ever, Americans are organizing for a brighter future. This was especially apparent when Hurricane Harvey hit Texas and Louisiana at the end of the month. Candidates and organizations around the country jumped into action to support the relief efforts before the storm even ended. Elected officials from Massachusetts to California, progressive organizations, and nonprofits asked their supporters and friends to contribute to slates of local nonprofits in the affected areas by using Tandem Fundraising. This ActBlue feature lets donors split a single contribution among several groups, like humane societies, diaper banks, and community foundations. We were excited to see how easy Tandem Fundraising made giving during the crisis. Our Outreach Team quickly connected with organizations responding to the storm and helped 32 charities raise their first dollar ever on ActBlue through Tandem forms. The surge in Tandem donations can be seen in the graph below. Additionally, four of the five highest-grossing contribution forms across ActBlue for the last week of August were Tandem forms supporting local nonprofits doing Harvey relief work. It was a big month for ActBlue Express. Over 60,000 new users signed up for the time-saving feature, which allows donors to give to any campaign or organization with a single click. Almost two-thirds of all contributions sitewide were made by ActBlue Express users last month, showing how important the tool is to donors and organizations alike. 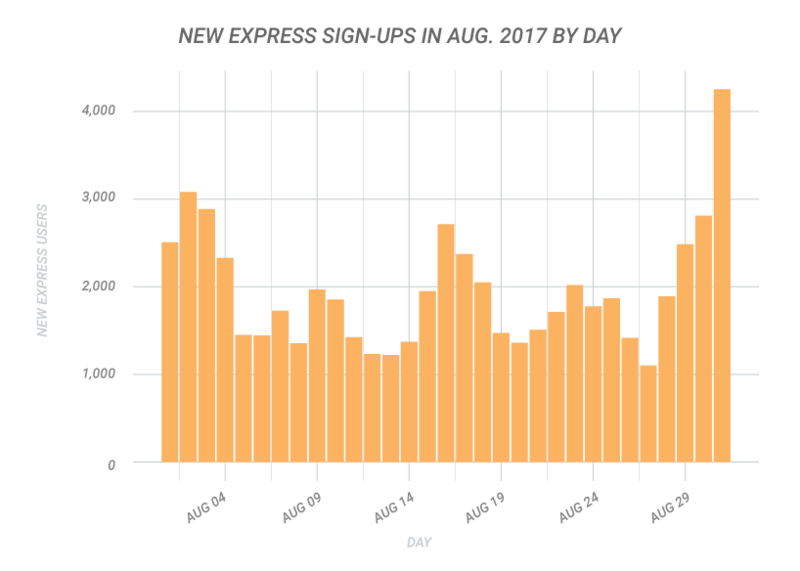 Going deeper into our data, we found that 65.6% of all new donors in August became ActBlue Express users, the highest percentage since January (67.3%). This conversion is very encouraging because summer months are typically slower than politically charged moments like the inauguration. We processed more than $8 million in recurring donations in August. When donors make recurring contributions, they enable campaigns and organizations to plan for the long haul. People who signed up for a recurring contribution in August to help hurricane relief will be supporting that crucial work for months to come, even when the headlines have moved on. Our Customer Service Team handled an average of 198 calls per day last month. Their dedication is one of the many reasons why so many new groups continue to sign up to use our tools. It might be hard to believe, but we’re officially more than halfway through Trump’s first year in office. The good news is that small-dollar donors and the organizations and campaigns they believe in are not slowing down. We can’t wait to see what they achieve with all of their hard work by the end of this quarter. In the meantime, if you have questions or comments about our August recap, you can reach a member of our team at info@actblue.com.